I kinda have a thing for luxury bedding — especially quality down pillows. It all started 10 years ago when we decided to buy the same down pillows that we had slept so well on during a stay at a Hampton Inn hotel. That was the first time I learned that you can actually buy the exact same high-quality bedding that you’ve enjoyed while staying at hotels. We still have those pillows, and we’ve used them every night since then. In fact, once we made the switch from “regular” store-bought pillows to high-quality down pillows, we’ve never gone back to traditional sleep pillows. Here’s my original review of the Hilton hotel pillows we purchased. 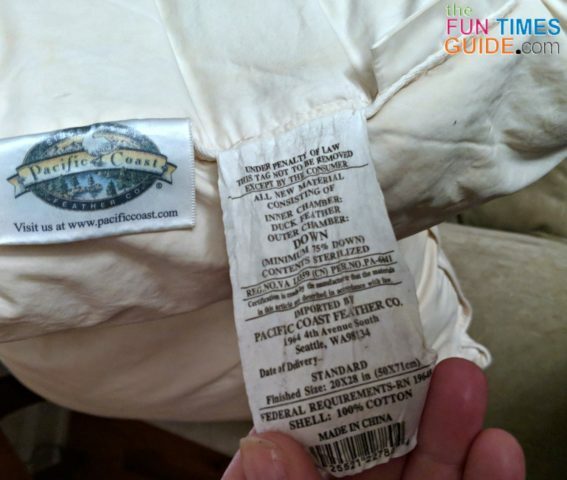 Today, our Pacific Coast down pillows are still fine to sleep on — but they’re rather wimpy after 10 years of use. It’s not until I held one up next to a brand new down pillow that I realized just how lifeless our old pillows were! Plus, your head is heavy (10 lbs. on average), and bearing the weight of your head night after night will eventually wear your pillow out, cause it to flatten, and reduce the amount of support it provides. 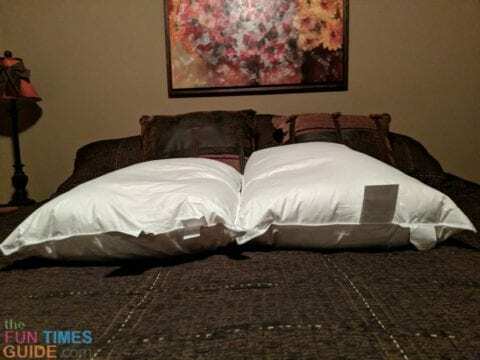 The National Sleep Foundation says to determine whether or not it’s time for a new pillow, you should fold it in half and see if it stays that way. If it does, then it’s time for a new one. But if it springs back to its rectangular pillow shape, then that pillow still has good support and some life left in it. …That’s what I’m talkin’ about!!! You really do get your money’s worth out of an expensive set of down bed pillows — as long as you take good care of them and air them out a lot. Hubby sleeps on his back most of the time. I sleep on my side. Hubby likes medium to firm support. I like very light support. Hubby likes the My Pillow best. I like down pillows best. Stomach sleepers need “extra soft” pillows to allow the head to sink to just the right level. Side sleepers need a “soft” pillow to cushion the head. Back sleepers need a “medium” pillow to provide more support for the head and neck. #1 – One reason I’ll never be without down pillows is because down blocks out sound so well! To block out noise, I just lie on my side — with 1 down pillow underneath my head, and 1 down pillow over the other side of my head. Sounds in the room are almost completely drowned out by the “soft” down that’s inside those pillows. My husband starts snoring in the middle of the night. I’m trying to sleep while my husband is watching TV. #2 – In addition to their noise-blocking feature, down bed pillows are perfect for side sleepers — especially if you suffer from frequent neck strain like I do (from being on the computer long hours at a time each day). I actually use my “soft” down pillow instead of doing the “towel roll” that he mentioned. #3 – Down pillows are so easily moldable to whatever shape you want them in. I call it the “squishability” factor. I usually fold in half (or bunch up) a down pillow before placing it underneath my head at night. Then, as I wriggle into my favorite sleep position on my side, the down pillow fills in all of the nooks and crannies. I keep another down pillow between me and the headboard at all times. #4 – Now don’t judge… but hubby and I sometimes work from our bed. And we even eat from our bed at times. Since our master bedroom has the biggest TV with the best sound — it’s perfect for watching NHL hockey games (Nashville Predators) and for binge-watching movies. A down pillow makes a great tray-like surface to hold a plate of pizza or a hot bowl of soup! Other pillows are too firm and don’t have the same cradling-factor. 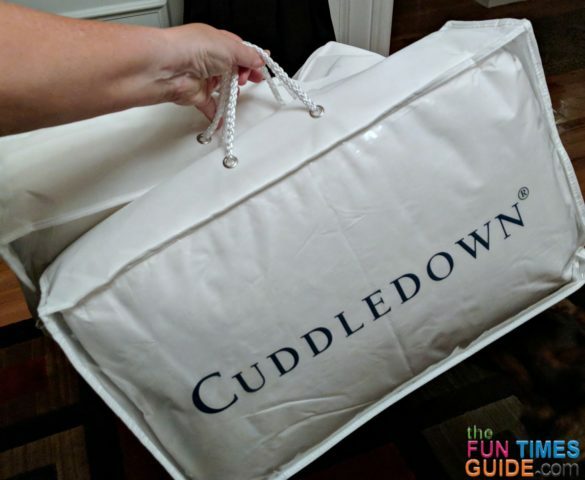 So… when the folks at Cuddledown asked if I’d be interested in reviewing one of their bedding products, I jumped at the chance to try their down pillows. I’ve actually been to the Cuddledown Outlet in Freeport, Maine — years ago. But I wasn’t in need of new pillows then. But now?… Now we could definitely use some new down bed pillows! Since we enjoyed our very first set of down pillows so much (the Pacific Coast ones from Hilton hotels), I wanted to make sure that we got a new set of pillows that were a similar match. Our Cuddledown pillows are a hypoallergenic 50% White Duck Down / 50% Small White Duck Feather blend. We got 1 “soft” (19 oz. of down) and 1 “medium” (26 oz. of down) Cuddledown pillow — both are queen size. The “soft” pillow is slightly more floppy than the “medium” pillow — which feels like it has a little more substance and structure to it. (Because it does.) But… if I only had Cuddledown “medium” pillows in my hands (without anything to compare them to), I would call them both “soft” pillows. That’s how miniscule the differences are to me. Internally and quality-of-sleep-wise, those extra 7 ounces of fill give you a pillow that’s ever-so-slightly more firm. However, both are soft enough for my personal taste and “not too firm” at all. I tend to gravitate to the “soft” one most often. Any Downsides To Cuddledown Pillows? I’ll be honest, when I first took the Cuddledown pillows out of the box, I was nervous that they were going to sound slightly “crunchy” up close to my ears — you know like some mattress protectors do. But these Cuddledown pillows DO NOT sound crunchy in any way! The only reason they sounded slightly different to me at first is because the outer material is not a “regular” cotton fabric, like I’m used to. Other than my initial impression of the cover fabric, I can’t think of a single thing I don’t like about these pillows. I’m certain these Cuddledown pillows will play an important role in our good nights’ sleep for the next 10 years… or more. And since I’m going to be diligent about fluffing and airing out these down pillows, I’m pretty sure they’ll last a good long time! Care instructions from Cuddledown: Fluff on a daily basis. Air outside to keep smelling fresh. Spot clean small stains with a mild detergent and thoroughly dry area with a handheld hair dryer. Machine wash warm with our Fine Fabrics Wash, or your preferred [low-sudsing] mild detergent. Thoroughly dry on low to prevent mildew. To keep down from clumping during the drying process, we recommend using down fluffers in the dryer. You shouldn’t make a habit of using them to prop your back — when watching TV or reading a book in bed, for example. The reason? Because that reduces the amount of air circulating through them, thus reducing their life. Down pillows need lots of fresh air! 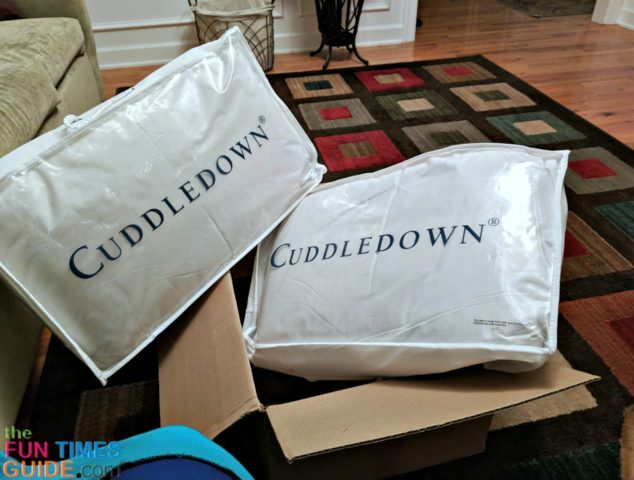 Without a doubt, the staff at Cuddledown went above and beyond to make sure we got the exact pillows we wanted with the right amount of firmness we desired. From my first correspondence with them to my last, they showed that they genuinely cared about our sleep… and our comfort. See what makes Cuddledown different. For consistency’s sake (since we like these pillows so much), I’m going to stick with Cuddledown when it comes time to order some new down bed pillows. They’ve impressed us so much — both the quality of the pillows themselves, and the knowledge & kindness of the people who work there. Who knows… maybe I’ll step things up in our guest bedroom and put some fresh new down pillows in there, too! I do know that I plan to order Cuddledown pillows as wedding gifts in the future. Luxury bedding is such a classy gift. Must read: Make your bed quickly like hotels do. Here’s how to do triple sheeting without the need for a duvet cover!